Picture plucking a ripe apricot from the tree and taking a bite. Feel the velvety, golden skin on your lips. Taste the juicy tang of the flesh on your tongue. Multiple layers of ambrosial sweetness explode with earthy voluptuousness and piquant twist. Saveur de l'Abricot means the flavor of apricot. Most of what we perceive as flavor is actually scent. With the fruity-floral richness of Chinese osmanthus and real apricot essence, Saveur de l'Abricot is an impressionistic fragrance capturing the sensuality of eating an apricot. 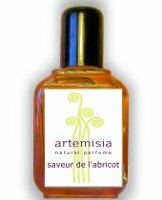 Artemisia Natural Perfume Saveur de l'Abricot is available in 7 gr Solid Perfume and 17 ml Eau de Parfum. Samples are also available. If that is a jammy apricot rather than a sugary canned fruit apricot I could be interested. Hard to say, but I’m generally interested in anything with osmanthus. I was able to sample this one at the L.A. Fragrance Salon last year and It’s a very nice fruity / floral natural perfume. NO sugary canned fruit here! I don’t remember it being jammy. Just a great sueded and fruity osmanthus scent. If you like Osmanthus, this scent is worth checking out. It’s a lovely, animalic and slightly herbaceous osmanthus with prominent apricot opening. It’s stone fruit down to the fuzz, like smelling apricots still on the tree on a hot day. Really interesting stuff.